Excise Department, Government of Punjab has completed computerization of all vehicles' records which are registered in any district of Punjab province. You can easily check and verify details about ownership, registration and tax details of your car, motorcycle or any other vehicle just by sending an SMS containing registration number of your vehicle to 9966. And you will get all important information on your mobile. If you found any discrepancy in the records, you can now easily get appointment for correction just by filling out a simple form. You can not only check details of your own car or motor cycle etc but you will also verify records of any used car before buying it. It will also helpful for people who are in business of selling and buying used cars to check records of any vehicle before making any deal. It is hoped that this service will eliminate car theft at least from Punjab. For any further help or assistance, you can contact on Toll Free Number 0800-9966. 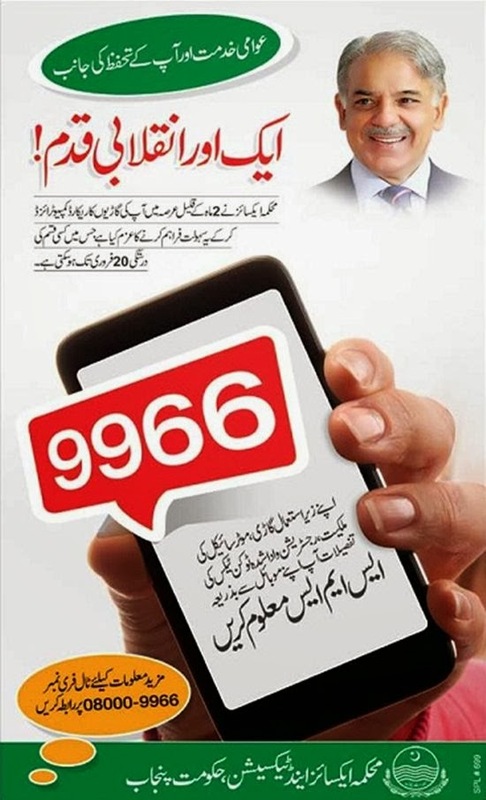 Punjab government has started another sms service for verification of vehicles' data. Send your car, bike etc registration number to 8785 and get information about owner name and vehicle details e.g. make and model, color, vehicle price, token tax payment status, challan payment date etc instantly via SMS. 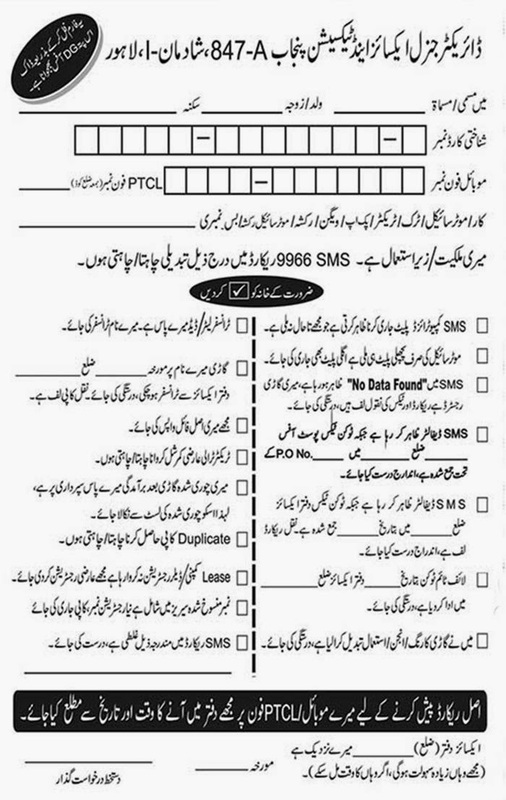 Following form can be used for making any correction or modification in the computer records possessed by Government of Punjab. Write click on this form and save it on your PC, then you can get its print out. Print and Photocopy of this form is also acceptable. Click here to see, how you can check details of Punjab registered vehicles online via MTMIS Website. It is a great site and it is working very well. Thank you...! how can chek my car owner detail ? Write registration number of your car in the form of ABC-1234 or ABC-YY-1234. Here ABC is city code, YY is year and 1234 will be replaced with your car number. And send it to 9966.
its a very good step towards the betterment of vehicles services. I get all the relevant information on call. loving the services .Punjab Hakomat Rocks!!!! can we check vhicle registration by cnic no. Stl 6150 , anyone ?! Dear Hina, purpose of this post is to share information only. All the procedure of vehicle verification is given in the post. If details about your vehicle is not found in this way, you can call to Excise and Taxation Department of Punjab on 08000-9966 for any further inquiry. ok sir just tell me abt information about my car who is the onwer with city he belong... just information sir. very thank full to u..
Dear Hina, why do you not contact with the concerned department of Punjab Government or law enforcement agencies to get information and also to recover your car? Sorry but we are not capable to help you in this regard. What is the registration year of your car? It might be very old or recently registered still not entered in the online database? Please call to toll free number 08000-9966 for further assistance. System is not updated. I have paid all token and have all reciepts but still sms is showing taken paid till 2013. Details of this number are also available. Just send this number in SMS in the form of LOP 3315 to "9966" or "8785". Please don't put dash "-" between vehicle number. Please search it by adding year e.g. LEA-nn-3893. Here nn is registration year e.g. 17. It's record is also available online. It is a land cruiser registered in Sheikhupura on the name of Khalid.